Some keys to remember whenever embarking on new landscaping projects, specifically planting trees, include utilizing native plants whenever possible, and landscaping in such a way that optimizes water usage as well as space. Also, select the right time of year for planting the tree. Do not plant in late spring or summer because the heat will stress the plant and may cause it to die. 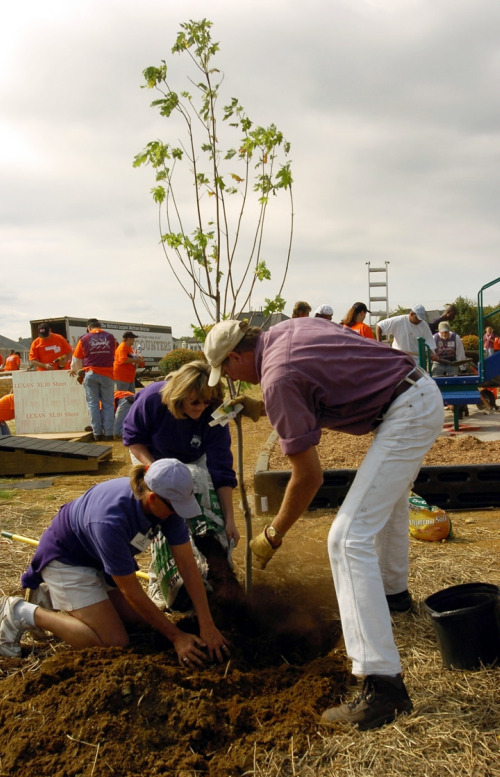 The best time to plant a tree is fall (autumn) or early spring. Use your index finger to check the soil moisture under the mulch. If the soil is cool to the touch, do not water. If it is warm and dry, then water. More plants are killed by over-watering than by under-watering. And finally, planting trees around your home will conserve energy and lower the cost of utility bills. Three well-placed deciduous (leaf-losing) trees on the east, south, and west sides of a home will shade it from summer sun and lower air conditioning costs by 10 to 50 percent. In addition to saving money, conserving energy directly translates to less carbon dioxide produced at the power plants. 1. Dig a hole twice as wide as and slightly more shallow than the root ball. This puts the aerated backfill soil where the new roots will grow and leaves a base of naturally firm soil for the root ball to rest on, which won't settle when watered. Some cities may require that you use a root barrier to prevent roots from pushing up the sidewalk or a cage to keep gophers out. If this is the case, the size and shape of the device will determine the dimensions of the hole. 2. Avoid the clay-pot syndrome. Roughen the sides and bottom of your planting hole with a pick or shovel so that root tips can penetrate the native soil. Smooth walls are like concrete to root tips. 3. If you are using potted trees, be gentle but firm when removing the container. Making sure to protect the foliage, lay the tree on its side with the container end near the planting hole. Hit the bottom and sides of the container until the root ball is loosened. 4. Check the root ball for circling roots (The definition of a circling root is a major root one-tenth the diameter of the trunk circling more than one-third the diameter of the root ball). If left in place, circling roots near the soil surface will eventually cut into the trunk as it continues to expand each year. Gently separate the roots, and guide them outward. Shorten exceptionally long roots, or those too stiff to straighten out. If roots are severely circled or kinked near the trunk, ask for your money back and get another specimen. Remember that the tiny root tips that absorb water and minerals for the tree die off quickly when exposed to light and air, so don't waste time. 5. Do not cover the root crown with soil. The crown is the place where the roots end and the trunk begins. Soil here will lead to rot at the base of the trunk. Aim to have the top of the root ball be about 1/2 to 1 inch above the surrounding soil. Check the height of the root crown by laying a straight piece of wood across the top of the hole. Adjust the height if necessary by lifting the tree by the root ball out of the hole and adjusting the soil level in the planting hole. 6. Orient the tree while you have the chance. If the tree has a preferred side, turn it toward a prominent viewpoint, such as your kitchen window. If it's lopsided, turn the side with more foliage toward the prevailing wind. This will encourage the other side to catch up. In sunny, arid climates, orient the tree so that the best-shaded side of the trunk faces southwest. Sunburn can kill the bark and layers of cells under it, thus weakening the tree and disfiguring the trunk and bark. When turning the tree, lift it from the base of the root ball, not from the base of the trunk. 7. Sit it upright! Once the tree is in the hole, stand back and make sure it's standing upright. Tilt the root ball until the tree is straight, then backfill firmly under and around it soil from the planting site; about one part amendment to three parts native soil is a good proportion for backfill soil. 8. Give your soil a boost. Though the latest trend in tree planting is not to add amendment to the backfill soil, there are instances when it can be useful. If your native soil is hard to work with (heavy clay) or retains little moisture (very sandy), you can treat it to some organic amendment. The amendment won't be a permanent solution to soil deficiencies, but it will help retain water and air in the soil around the root ball for the first few vital years. If adding soil amendment, always mix it with soil from the planting site; about one part amendment to three parts native soil is a good proportion for backfill soil. 9. Tamp the soil as you backfill. Using the handle end of your shovel, press down firmly to collapse any large air pockets in the soil. This will help stabilize the tree in the hole. Don’t step on the root ball! You might separate the trunk from the roots. Don't wait until the planting is finished; press down every few shovels of soil. Yes, you can tamp too much; excessive pressure (especially in clay soils) will reduce the soil porosity, which is essential for healthy root growth. As usual with trees (and most living things), practice moderation. 10. Get it wet! Build a temporary watering basin around the root ball to encourage water penetration. A tree that has a dry root ball can stand in a moist backfill without absorbing water! Fill several times to water deeply. Widen basin to include whole planting area after a month. 11. Stake well! Remove the square wooden nursery stake after planting. Stake the tree loosely for protection or support if needed. Provide two stakes per tree. If the trunk can't stand up on its own, stake it so that it stands upright. Use non-abrasive ties in figure-eight pattern. Plan to remove stakes as soon as the tree can support itself, in six to twelve months. 12. Mulch till you drop! Cover the entire planting area, except a small circle at the base of the trunk, to a depth of 3 to 4 inches with bark, wood chips, pine needles or leaves. Mulch keeps the topsoil temperate for root growth, reduces surface evaporation of water, provides nutrients, and slows weed and grass growth around the tree's base. It also prevents a hard crust from forming on top of the soil, which slows water penetration.